We’re not really sure what these cutouts of cartoon characters are all about, but the job itself is pretty interesting. 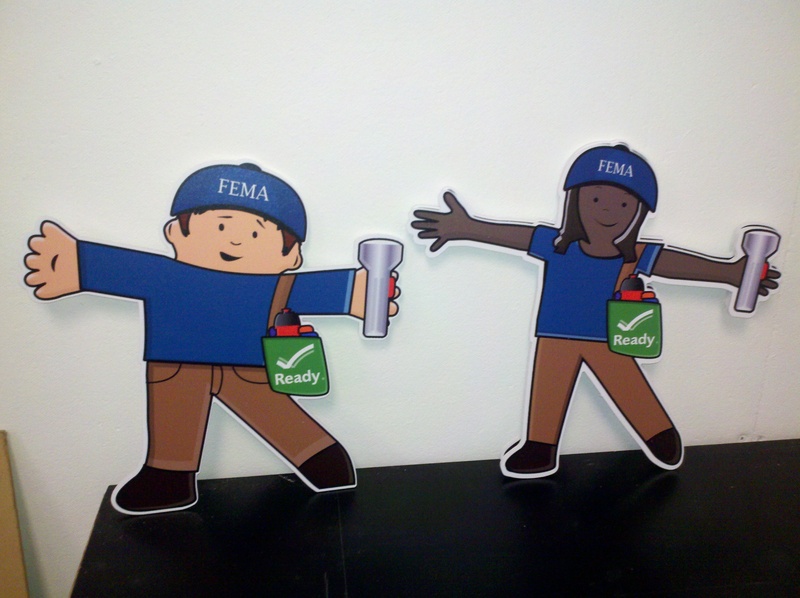 We printed the cartoon character cutouts for FEMA, the Federal Emergency Management Agency. They help people recover from natural disasters. In this case, they provided us with artwork of the characters, we generated a cutting path for our CNC router, and the rest is history. We printed on sintra and the computer cut them out. Bing badda bing! Whether you have cutouts to do of people, things, or cartoon characters, our system does them quickly and affordably. We do plenty of people cutouts, but we’ve also done things like cutouts of cars, logos, and cartoon characters. Give us a call when you need cutouts! This entry was posted in die cut signs and tagged cut out logos, cutouts of people, die cut shapes. Bookmark the permalink.